سلیمانی, مهرداد, ادیبی, احسان, شاهسونی, هاشم, سکوتی, محمد رضا. (773). تصویرسازی لرزه‌ای در کمربندهای رورانده با ساختار پیچیده با نشانگرهای جنبشی میدان موج. 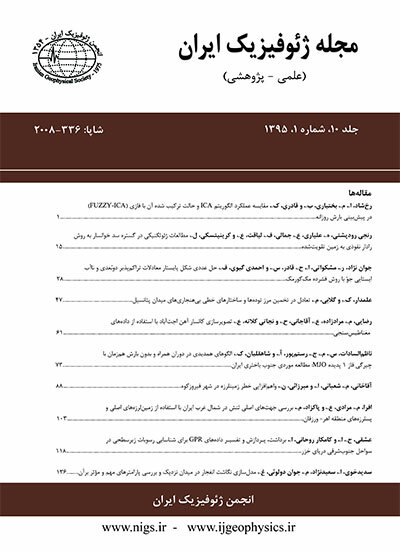 مجله ژئوفیزیک ایران, 7(4), 95-116. مهرداد سلیمانی; احسان ادیبی; هاشم شاهسونی; محمد رضا سکوتی. "تصویرسازی لرزه‌ای در کمربندهای رورانده با ساختار پیچیده با نشانگرهای جنبشی میدان موج". مجله ژئوفیزیک ایران, 7, 4, 773, 95-116. سلیمانی, مهرداد, ادیبی, احسان, شاهسونی, هاشم, سکوتی, محمد رضا. (773). 'تصویرسازی لرزه‌ای در کمربندهای رورانده با ساختار پیچیده با نشانگرهای جنبشی میدان موج', مجله ژئوفیزیک ایران, 7(4), pp. 95-116. سلیمانی, مهرداد, ادیبی, احسان, شاهسونی, هاشم, سکوتی, محمد رضا. تصویرسازی لرزه‌ای در کمربندهای رورانده با ساختار پیچیده با نشانگرهای جنبشی میدان موج. مجله ژئوفیزیک ایران, 773; 7(4): 95-116. در این تحقیق، امکان تهیه مقطع لرزه‌ای با کیفیت زیاد با استفاده از روش نوین برانبارش سطح بازتاب مشترک مورد بررسی قرار می‌‌گیرد. بدین‌‌لحاظ، به‌‌منظور برطرف کردن برخی از مشکلات تصویرسازی لرزه‌ای، داده‌های به‌دست آمده در یکی از مناطق جنوب غرب ایران که دارای ساختارهای زمین‌شناسی بسیار پیچیده است، مورد پردازش قرار می‌گیرد. در ابتدا داده‌ها تحت پیش‌پردازش‌های مرسوم قرار گرفته و برای استفاده از تکنیک‌های تصویرسازی زمانی آماده می‌‌شود. در ادامه داده‌ها به دو روش متفاوت تحت پردازش قرار خواهند گرفت. نتایج به‌دست آمده از روش پردازش متداول نشان داد که این روش‌ها در تصویرسازی لرزه‌ای از ساختارهای پیچیده دارای ضعف‌های متعددی هستند. به‌‌منظور برطرف کردن این مشکلات، از روش برانبارش سطح بازتاب مشترک استفاده شد. بااین‌‌حال بسیاری از روش‌های نوین پردازش نیز مانند روش برانبارش سطح بازتاب مشترک علی‌رغم مزایای بسیار، در برخی مناطق با زمین‌شناسی پیچیده نیز در تصویرسازی لرزه‌ای با مشکل روبه‌رو خواهند شد. به همین دلیل روند جست‌وجوی نشانگرهای جنبشی میدان موج و فرایند بهینه‌سازی آن در روش سطح بازتاب مشترک به گونه‌ای تغییر کرد که بتوان در مناطق بسیار پیچیده نیز تصاویر لرزه‌ای با کیفیت قابل‌‌قبول به‌دست آورد. مقطع‌های لرزه‌ای و مقطع‌های نشانگرهای جنبشی میدان موج به‌دست آمده در این روش در مقایسه با مقطع لرزه‌ای به‌دست آمده در روش پردازش متداول نشان داد که می‌‌توان در تصویرسازی لرزه‌ای در ساختار‌های پیچیده، به روش‌های نوین اعتماد کرد. Structural interpretation in geologically complex structures is a controversial task in the field of seismic interpretation. In recent years, Seismic imaging technology continues to make remarkable progress in imaging of complex structures such as sub-salt, fault-and-thrust areas and mud volcano bearing areas. The latest advances in the areas of migration and velocity estimation are the reverse time migration, pre-stack reverse time-depth migration, common reflection surface stack, partial common reflection surface and common diffraction surface stack methods. The continuous advances in computing facilities make such data-driven approaches feasible which have increasingly gained in relevance in recent years. In these methods, the subsurface structures are imaged without deriving a complete model for the elastic properties of the layers. In this case, just an implicit knowledge of the elastic properties directly derived from data would be sufficient. Common reflection surface stack method is one of the data-based seismic imaging methods which simulate the zero offset section. It has the great advantage that it is independent from the velocity model. By paraxial ray theory, the second order travel-time equation of the common reflection surface would be derived which gives a surface-shape operator that works as the stacking surface. The basic idea of this method is to take the kinematic reflection response of a segment of the reflector with defined curvature and orientation by two hypothetical experiments providing the wavefronts of the so-called eigenwaves. One eigenwave is obtained by placing a point source at the reflector that produces the upgoing normal incidence point wave. An exploding reflector experiment yields the second upgoing eigenwave called the normal wave. The curvature and the raypath of the wavefronts of these waves are known as the parameters of the stacking operator. To simulate the zero offset section, three parameters or kinematic wavefield attributes are needed one of which is related to the emergence angle of the central ray or to the orientation of the reflector segment, while two others are related to the curvature of the reflector. Therefore, the common reflection surface stack method, unlike the common mid-point stack method, is not restricted to a subset of multicoverage data, and it also works on the full data volume. Seismic data from a complex structure in the Southwest of Iran was processed by the common reflection surface stack method to overcome some of the ambiguities of seismic imaging in such regions. In the first step, some preprocessing was done on the data to be prepared for seismic imaging. Then, the data was processed with two imaging methods. The results obtained by the conventional method showed lots of ambiguities in the final seismic section. To solve these problems, the common reflection surface stack method was applied to the data. However, the result was not promising and some sort of optimization on the method was performed. This optimization gave the best kinematic wavefield attributes in complex structures. However, due to large computation time and a large amount of sections that this method gives, the optimized common reflection surface stack was used from the beginning. The result of the latter method proved that using this method in geologically complex regions could be trusted and helpful in obtaining high quality images. ادیبی، ا.، سلیمانی، م.، سکوتی، م. ر.، و پیروز، ا.، 1389، انتخاب بازه بهینه به منظور افزایش نسبت سیگنال به نوفه و پیوستگی پدیدها در روشهای پردازش CRS و CDS: چهاردهمین کنفرانس ژئوفیزیک ایران، تهران. ریاحی، م.، و بازرگانی، ف.، 1383، بررسی کارایی روش مهاجرت PSPC در پردازش داد­‌‌های لرزه­ای به‌دست آمده از محیط­های دارای تغییرات جانبی سرعت، مجله فیزیک زمین و فضا، 30(2)، 91-79. سلیمانی، م.، 1388، برانبارش سطح پراش مشترک، ارائه یک روش نوین در حل مسئله‌‌ تداخل شیب­ها: پایان‌‌نامه دکتری، دانشگاه صنعتی شاهرود. سلیمانی، م.، ادیبی، ا.، سکوتی، م. ر، و پیروز، ا.، 1389، افزایش کیفیت مقطع برانبارش شده CRS و برطرف کردن مسئله‌‌ تداخل شیب­ها به‌‌کمک روش برانبارش CDS؛ مطالعه موردی در ایران، چهاردهمین کنفرانس ژئوفیزیک ایران، تهران. شاهسونی، ه.، 1390، ارائه روش تصویرسازی مبتنی بر مدل به منظور بهبود کارکرد روش برانبارش سطح پراش مشترک: رساله دکتری، دانشگاه صنعتی شاهرود. Baykulov, M., 2009, Seismic Imaging in Complex Media with the Common Reflection Surface Stack: Ph. D Thesis, Hamburg University. Bergler, S., 2001, The Common-Reflection-Surface Stack for Common Offset - Theory and Application: M.Sc. thesis, University of Karlsruhe. Cervený, V., 2001, Seismic Ray Theory: Cambridge University Press, Cambridge. Heilmann, Z., 2007, CRS-stack-based seismic reflection imaging for land data in time and depth domain: Logos Verlag, Berlin. Hertweck, T., 2004, True-amplitude Kirchhoff Migration: Analytical and Geometrical Considerations: Logos Verlag, Berlin. Höcht, G., 1998, The Common Reflection Surface Stack: M.Sc. thesis, University of Karlsruhe. Hubral, P., 1983, Computing true amplitude reflections in a laterally inhomogeneous earth: Geophysics, 48(8), 1051–1062. Hubral, P., Schleicher, J., and Tygel, M., 1996, A unified approach to 3-D seismic reflection imaging, Part I: Basic concepts: Geophysics, 61(3),742–758. Hubral, P., 1999, Special Issue on Macro-Model Independent Seismic Reflection Imaging: J. Appl. Geophys, 42, Amsterdam. Elsevier. Hubral, P., Krey, T., 1980, Interval velocities from seismic reflection traveltime measurements: Soc. Expl. Geophys., Tulsa. Jäger, R., 1999, The Common Reflection Surface Stack - Theory and Application: M.Sc. thesis, University of Karlsruhe..
Jäger, R., Mann, J., Höcht, G., and Hubral, P., 2001, Common-reflection-surface stack: Image and attributes: Geophysics, 66(2), 97–109. DOI:10.1190/1.1444927. Leite, L. W. B., Lima, H. M., Heilmann, B. Z., and Mann, J., 2010, CRS-based Seismic Imaging in Complex Marine Geology, 72nd EAGE meeting, Barcelona, Extended abstracts, P396. Mann, J., Jäger, R., Müller, T., Höcht, G., and Hubral, P., 1999, Common-reflection-surface stack: a real data example: J. Appl. Geophys. 42(4), 301-318. Mann, J., 1997, Image Wave Theory and its Application to Seismic Reflection data: Logos Verlag, Berlin. Mann, J., 2001, Common-Reflection-Surface stack and conflicting dips: In Extended abstracts, 63rd EAGE, P077. Mayne, W. H., 1962, Common reflection point horizontal data stacking techniques: Geophysics, 27(6), 927–938. Müller, T., 1999, The Common Reflection Surface stack method – seismic imaging without explicit knowledge of the velocity model: Der Andere Verlag, Bad Iburg. Robein, E., 2003, Velocities, time imaging and depth imaging in reflection seismic, principles and methods: EAGE Press, Netherlands. Robein, E., 2010, Seismic Imaging: EAGE Press. Netherlands. Schleicher, J., Hubral, P., Tygel, M., and Jaya, M. S., 1997, Minimum apertures and fresnel zones in migration and demigration: Geophysics, 62(1),183–194. Shahsavani, H., Mann, J., Piruz, I., and Hubral, P., 2011, A model-based approach to the Common-Diffraction-Surface stack - theory and synthetic case study: Journal of Seismic Exploration, 20(3), 289-308. Soleimani, M., and Piruz, I., 2007, NIP tomography inversion, a new improved method for velocity model estimation; synthetic data example: Presented at the 19th ASEG, Australia, Perth. Soleimani, M., Piruz, I., Mann, J., and Hubral, P., 2009, Common-Reflection-Surface stack: accounting for conflicting dip situations by considering all possible dips: Journal of Seismic Exploration, 18(2), 271-288. Soleimani, M., and Mann, J., 2009, Merging aspects of DMO correction and CRS stack to account for conflicting dip situation: 12th Wave Inversion Technology (WIT) Meeting, Hamburg, Germany. Soleimani, M., Mann, J., Adibi, E., Shahsavani, M., and Piruz, I., 2010a, Applying the CRS stack method to solve the problem of imaging of complex structures in the Zagros overthrust, south west Iran: In extended abstract, 72nd EAGE, Spain, P556. Soleimani, M., Mann, J., Adibi, E., and Piruz, I., 2010b, Improving the seismic image quality in semi-complex structures in north east Iran by the CDS stack method: Presented ate the 72th EAGE, Barcelona. Soleimani, M., Adibi, E., and Juergen Mann, 2011, Imaging in complex structures by post-stack time migration and CRS stack: 12th International Congress of the Brazilian Geophysical Society (SBGf). Thore, P., de Bazelaire, E., 1991, Analysis of the common midpoint gather by decomposition into elementary wave fronts: Geophysal Prospecting, 39(4), 453–471. Vieth, K., U., 2001, Kinematic Wavefield Attributes in Seismic Imaging: Logos Verlag, Berlin. Yilmaz, Ö., 2001, Seismic Data Analysis, Vols. 1 and 2. SEG, Tulsa. Zhang, Y., Bergler, S., and Hubral, P., 2001, Common-reflection-surface (CRS) stack for common offset: Geophysical Prospecting, 49(4), 709-718.